Here is this week's edition of Tough Call. 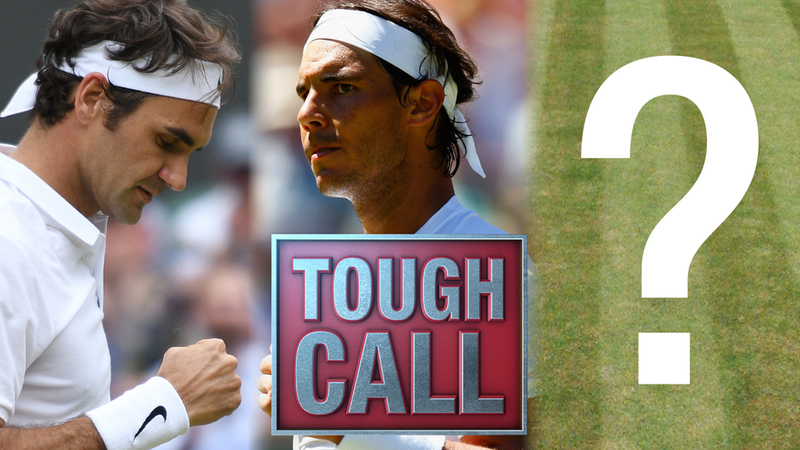 Who Would You Pick at Wimbledon: Federer/Nadal or Rest of Field? ~ Roger Federer and Rafael Nadal have been the two best players of the year: They’re tied for the most ATP World Tour titles on the year with four each, they split the first two majors, and they’re also head and shoulders above the Top 2 on the year-to-date points race (Nadal No. 1, Federer No. 2). ~ They’ve won nine Wimbledon titles between them (Federer seven, Nadal two) compared to five for the rest of the field combined (Novak Djokovic three, Andy Murray two). ~ The only two players Federer has lost to this year are out of Wimbledon already: Evgeny Donskoy, who beat him in Dubai, and Tommy Haas, who beat him in Halle, both lost in the first round. ~ Murray and Djokovic have dominated Wimbledon in recent years: They’ve won five of the last six titles here, with Djokovic winning in 2011, 2014 and 2015, and Murray winning in 2013 and 2016 (only Federer broke up that streak with his victory in 2012). ~ Djokovic has a new attitude: Not only does he have Andre Agassi on his team now, he has Mario Ancic, a former Wimbledon semifinalist. This is also the first time in five majors where Djokovic isn’t the defending champion less pressure? Forget throwback Thursday—it’s been a throwback year for Roger and Rafa. But despite their dual dominance this season, taking 126 other players to win Wimbledon (OK, the roughly 10-15 others who could conceivably prevail instead) is the safer bet. That’s mainly because I’m waiting for the Federer slip-up to happen. Although I’m enjoying his renaissance as much as anyone, this run almost seems too good to be true. As for Nadal, he’s been vulnerable at Wimbledon for years. I could see someone like Marin Cilic taking advantage. It’s difficult to pick two guys over an entire field, but with the way these two have played this year, that’s what I’m forced to do. Federer is the undisputed favorite, and Nadal reinforced on Monday that he can absolutely be a force on grass. I have a sneaking suspicion that Andy Murray and Novak Djokovic are due for a return to form, but I’m still sticking with the old guns. This is a reasonably tough call but I am taking Federer and Nadal over the rest of the field, unhesitatingly. Federer got the boost he needed from winning Halle and he is both rested and ready. Nadal is long overdue for a sparkling run on the lawns. Federer is a strong favorite to win his eighth crown on Centre Court and Nadal in my mind could under the right circumstances take his third title. If it were this time last year, I would go with the rest of the field, but so far this year, Federer and Nadal have derailed the rest of the field, surprising everyone including themselves. They have split the first two Grand Slams and the five Masters 1000s, while Djokovic, Murray, Wawrinka, and the rest of the field have struggled. I’m betting all my chips on Federer and Nadal. Nadal and Federer have been incredible, but the magic streak has to dip at some point. That's one reason why the rest of the field has a better shot this fortnight. Murray and Djokovic have also won five combined titles at the All England Club. Cilic is a huge threat on grass, and Milos Raonic has been unsteady, but the lethality of the 2016 finalist's serve can't be discounted. Federer is one of the best-ever on grass, and, better yet, he's rested again, the same way he was in Australia. Rafa's grass-court game has been in decline, but that's what we said about his game in general until 2017. Both of their draws look manageable, and couple of upset artists—Kyrgios and Wawrinka—are already gone.